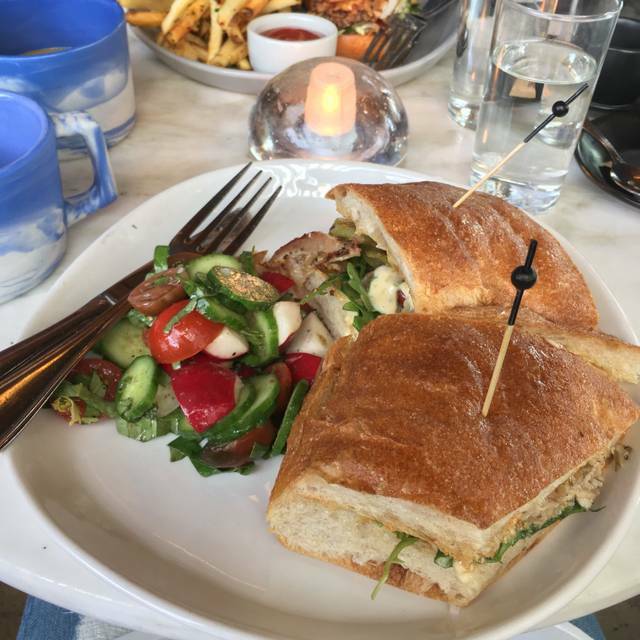 You must make reservations at least 5 minutes in advance of the time at Superba Food & Bread. Small free private lot & street parking. Equal parts Bakery, Café, and urban park, we"re proud of our space, our food and our people. We are committed to sharing these lovely things with our community. Great food should be accessible to all who seek it! inventive, classy and delicious. they put a nice twists on the classics. Food was excellent so happy to be accommodated with a large group. Wonderful ambiance and service! The food is fantastic. We happened to be sitting next to the owner who comped is a glass of wine each, which made a great impression on us. We’ll definitively be returning! Really nice dining experience in an unpretentious atmosphere. Food was prepared with care. My pork chops were ever so slightly over cooked, but this was to be expected as they were quite thin. Everything had great natural flavors, however. Service was attentive without being overbearing. Overall, a positive dining experience that will lure me back again. We go to a restaurant and expect to find menu items that taste terrific and our prepared to our taste and style. Superba is no exception. The food is excellent. We can recommend everything on the menu. We've just about tasted everything there. Highlights include the lamb ribs, the butternut squash soup, the hamachi crudo the barrundi (sp) and the salmon. We always leave with a loaf of bread. We think the sourdough is the best. But, actually AND, it is special when we go to a restaurant where all the staff appears to be really happy to be at the restaurant. Service is excellent and all the staff cover for each other..AND, they remember who you are. The food always meets or beats our expectations, the staff have become people we like to see..Hope you all enjoy this SUPERB(a) restaurant. Can't recommend it enough. Superba was incredible! Every single dish was delicious, fair prices for the quality and portions and the service was wonderful. Music and atmosphere was on point. 10/10 wish I lived closer! One of my favorite restaurants in Venice. Always consistent and delicious food. Great food and service. Healthy and fun. Just tables a bit close and small and that makes it loud. It was nice to order a pastry at the counter prior to sitting down! What an amazing assortment of fresh pastries and cookies to die for! Average... problem is menu never changes. So gets old quick. Great food! A little slow. Pastry case looked unreal delicious. Setting very hip yet kid friendly. All in all, close to perfect. I eat here regularly. Service on this night was way off, but management did their best to make it right. Also, the bar management may want to revamp their wines by the glass— rather expensive for just so so offerings. everyone loved every dish. appreciative that there are multiple vegetarian options. Amazing food and service as always. We were disappointed 3 times in a row now. The food was great and service was good. Seated at the time of the reservation and food arrived pretty quickly. Compliments to our lovely waitress. We were there for a long ‘catch-up’ lunch. She was lovely and didn’t rush us AT ALL! It made our time together, after 20 years an especially nice event. Thanks for understanding!! We ordered four items to split between three of us. The server only brought us 3 plates of vegetables and never checked with us to see if we were okay or wanted to order more. Best to go early if you want to talk, the later you go the louder it gets. This local Venice restaurant can always be counted on for a varied menu of delicious offerings. Lots of veggie choices as well. We got a table for 9 last minute - superba totally came through! The atmosphere in the early evening was lovely and the servers friendly and helpful. However our food was awful. I’ve had many delicious small plate at Superba for lunch and good breakfasts but the dinner was a complete disappointment. Our Caesar salads were dry and completely without flavor. The rotisserie chicken was very salty and the portion size small, given the price. The saving grace was the roasted carrots. We saw a fellow guest eating the salmon “large plate” and the portion was tiny. Especially given the price. The patio was very cold - even with heaters. They need to figure out a way to enclose the patio in the winter. Awesome food and awesome atmosphere. Seamless service even when you had more than one person helping you out. 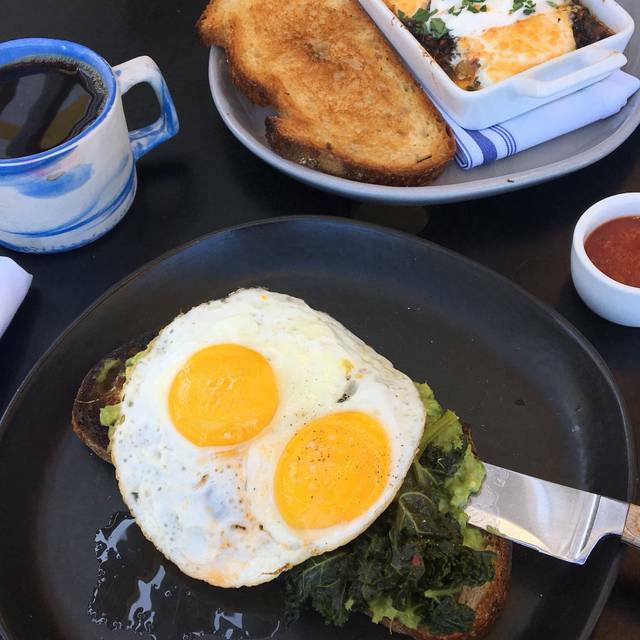 Went to Superba with my girlfriend on Valentine's Day. Had a late reservation and by the time we arrived, service was already winding down so we were promptly seated. Our server was very friendly and attentive. Started with some of their signature bread, which was delicious and supremely buttery, if a bit heavy on the salt. We ordered the salt-baked sweet potato, a special for the day, and I thought it was amazing, a great mix of savory and sweet. My girlfriend loves lamb, so she ordered the smoked lamb ribs, and I had the cacio e pepe. She thought the spice mixture used on the lamb was a bit unusual, but she liked the flavors overall. It's definitely heavier than the usual French or Greek rack of lamb preperation, in a stick-to-your-ribs sort of way. I was pretty disappointed in my cacio pepe, it was drowning in butter and oil. The flavor was there but I was distracted by the pool of oil in my bowl. I wouldn't mind coming here again, the atmosphere is super casual, though I'd probably stick to brunch or lunch. The food was great! The staff was friendly. 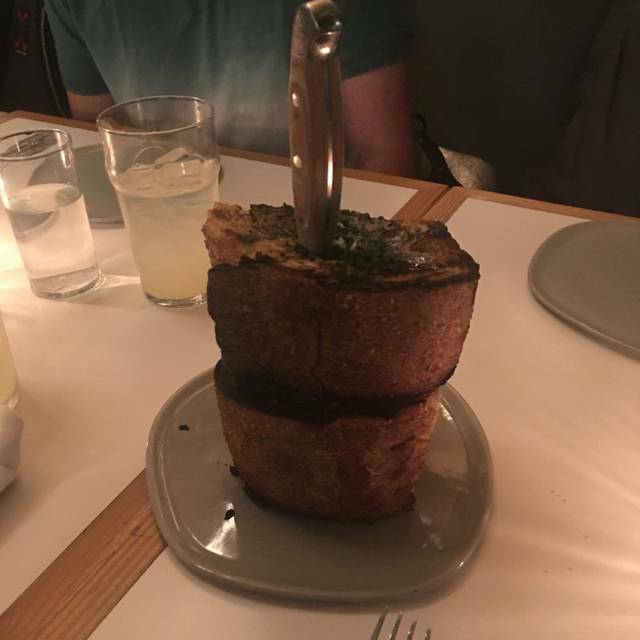 The bread was amazing! I will be returning sometime soon for more bread and to try other options in the menu. Came here for Valentine’s Day 2019. Our server was great, however the food here continues to go downhill every visit. Nothing special for what you are paying. Bring back the 2016 Superba !! Great neighborhood spot. Glad we found it! Will definitely be back. Good food, great prices, friendly service, nice ambiance-what’s not to like? This place is always great. Friendliest servers. Great food and ambience. I have dined twice in one week at Superba and had Kelly as our waitress each time. She is fantastic as is the food, ambience and price. Great mushroom and avocado toasts. Coffees and teas superb, what else can one say. Meet, greet, eat. Such a great place if you are in Venice a must! The food is delicious and a pastry to go isn’t a bad idea either. I had crispy cod and a lemon meringue tart. They were good but the tart shell was hard to eat with just a fork. Service was very good. I was seated on the patio, which wasn’t the most comfortable on a rainy night. It was drafty and the table was bare metal with a hole where an umbrella would go.